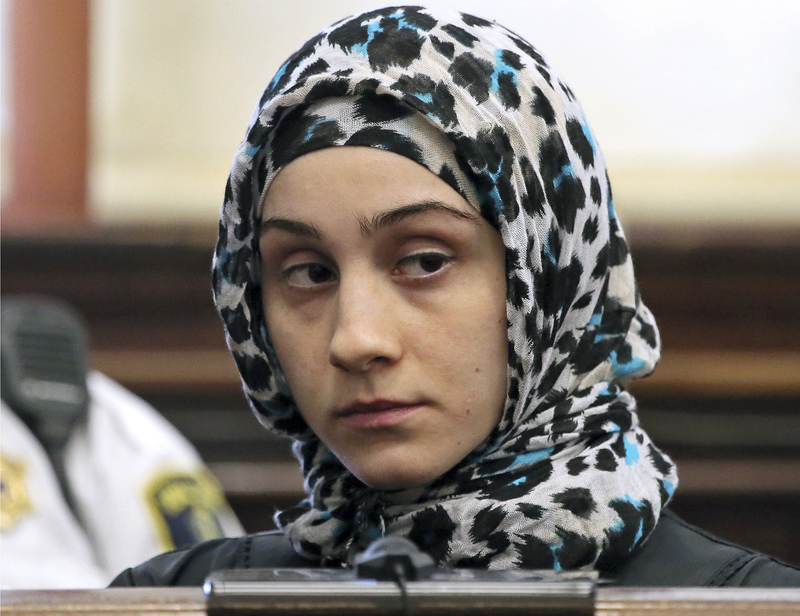 NEW YORK - A sister of the Boston Marathon bombing suspects was led away in handcuffs Tuesday after a brief court appearance on allegations that she threatened to "put a bomb" on a perceived romantic rival, which her lawyer called "an uncorroborated claim." Ailina Tsarnaeva, 24, who lives in New Jersey, was held on aggravated harassment charges. She is accused of threatening a woman who previously had a romantic relationship with her husband. "Leave my man alone," she said in a phone call on Aug. 25, according to the criminal complaint. "Stop looking for him. I have people. I know people that can put a bomb where you live." Manhattan Assistant District Attorney Jennifer Abreu said Tsarnaeva was apparently referencing her brothers, Dzhokhar and Tamerlan Tsarnaev, who are accused in the deadly April 2013 Boston marathon bombing. Prosecutors said Tsarnaeva had driven past the woman's house after an order of protection was issued. Tsarnaeva's attorney, Susan Marcus, said her client disputes making such statements. "My client is an easy target," Marcus said. "This is an uncorroborated claim." Marcus said Tsarnaeva, a mother of two including a 5-month-old, and her family had "absolutely no means," and she did not deserve to be jailed. "I have nothing to say," she told reporters. Prosecutors said she picked up someone who passed a counterfeit bill at a restaurant at a Boston mall and "lied about certain salient facts during the investigation." Dzhokhar Tsarnaev is charged with building and planting the two pressure cooker bombs that exploded near the marathon's finish line, killing three people and injuring more than 260 others. He has pleaded not guilty. Tamerlan Tsarnaev died after a gunbattle with police.